A recently destroyed painting from 1999, called Blue Blood, Black Death. I chopped it up as it was riddled with borer, but kept a small piece (now soaking in turps) from the bottom left hand corner. This painting came from a group of five, three shown at Anna Bibby Galley in Auckland in 1999, one sold, one lost and the rest destroyed. One of them, Game, came up for auction recently in Auckland and depicts a mokomokai and the Star Trek Enterprise, a comment on Delvanius Prime's valiant efforts to return mokomokai to NZ, while NZ's national Museum, Te Papa was exhibiting a Star Trek fanzine-type exhibition. 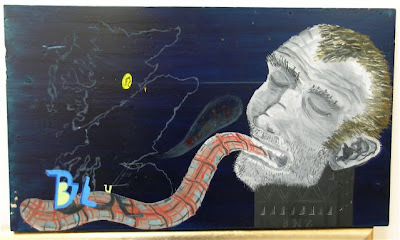 This one shows the aged artist, at the time 22, thinking about his recent shift to Wellington (the BNZ building on Willis St), his history, lineage and future.